You can have over 300 popular chord progressions from popular songs (NO DOGS) � if you are a Band-in-a-Box user - for just pennies per song!!! The 300 chord progressions (songs) on this disk have been optimized for use with your Band-in-a-Box program. They were entered in a manner to make the most musical use of the "A" and "B" substyle feature of your Band-in-a-Box program. All of the songs have introductions and endings (no fade-outs). All tag endings have been entered in such a way as to eliminate any unwanted drum fills that were not programmed into the original sequence. 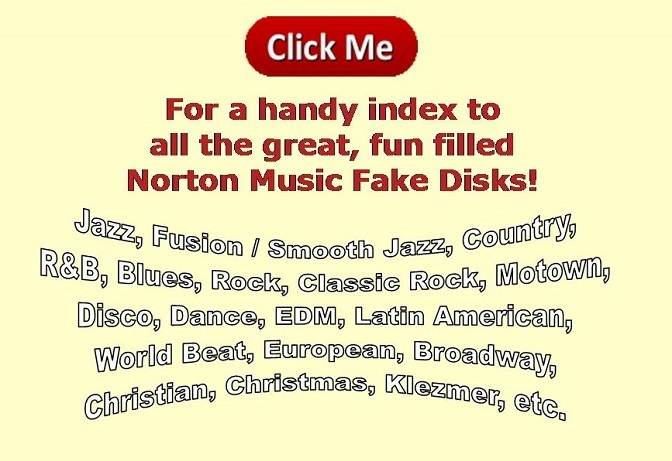 Norton Music's Fake Disk #1 will be a prized addition to your Band-in-a-Box collection. and 20 MISCELLANEOUS other songs!!! I have thousands of music books and sheets in my personal collection, (I love music). I frequently have more than one copy of any given song. In many cases, each edition of the same song may have slightly, or even radically different chords. In each of these cases, I have used the chords that sound best while being played back through the Band-in-a-Box program, utilizing the program's assets, and minimizing its limitations. I used either the version that sounded best during playback or I combined the chords from different versions so that they sounded good to my ears. Just browse the song list in the right hand column to see the song titles contained in this disk! The Fine Print: This disk is GUARANTEED to work with Band-in-a-Box � In the unlikely event the product is defective or gets corrupted during delivery, it will be replaced. � It is important to note that all Norton Music Fake DISKS contain chord progressions only... There are no copyrighted melodies or lyrics on the Fake DISKS. The song titles are used only to identify a particular chord progression. � The song titles used are not the only songs to share any particular chord progression but conservation of space limits me to listing only one title per chord progression. � The degree of compatibility of the songs with the currently available styles for Band-in-a-Box varies. � There are no user styles in any of the fake disks either by PG Music (the creators of Band-in-a-Box) or by Norton Music. � As is typical in the software industry, all sales are final.